The trade deficit of the world’s third largest economy hit a new record of around $108 billion in 2014, the highest since 1979. Sharp demand for energy in Japan after the Fukushima disaster boosted imports; lower oil prices could reverse this in 2015. Japan's trade deficit rose by 11.4 percentcompared to 2013 to reachto ¥12.78 trillion,the Finance Ministry said in a report on Monday. The balance of trade in goods remains negative for the fourth straight year. One of the main reasons was a surge in imports ahead of April’s sales tax increase and the country's growing demand for natural resources caused by the disabling of all the country’s nuclear power plants after the Fukushima disaster in 2011. Imports of petroleum products in 2014 increased by 3.1 percent, while the purchase of liquefied natural gas was up by 1.2 percent. 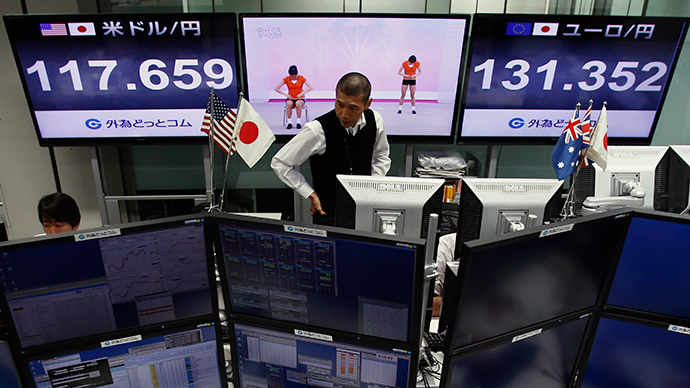 The rising resource prices were exacerbated by the yen weakening against other foreign currencies. The yen slid against the US dollar by 8.7 percent to 105.30 from a year earlier, largely due to the controversial program of monetary easing carried out by the Bank of Japan. However, despite such unprecedented figures, some analysts believe Japan’s trade balance may improve, as a recent drop in global oil prices is likely to reduce the country’s import costs. A falling domestic currency usually props up exports, as locally produced goods become cheaper abroad. Thus, in the case of Japan, it boosts revenues from foreign trade in yen terms. Japan’s exports exceeded forecasts in December, hitting 12.9 percent from a year earlier - the highest level in six years. Japan’s exports to EU gained 8.3 percent to $64 billion (¥7.59 trillion) while imports from the region increased 6.6 percent to a record $69 billion (¥8.16 trillion). Shipments to the United States expanded 5.6 percent to $115 billion (¥13.65 trillion), as the imports rose 10.7 percent to $63 billion (¥7.54 trillion).